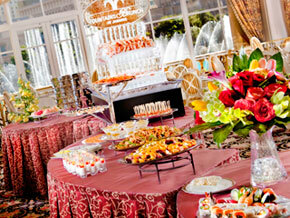 Brunches in Las Vegas offer everything from caviar and waffles to a Junk Food Platter with Hostess cakes. With dramatic views of Red Rock Canyon in the background and the pool at your feet, you can savor "Rock 'n' Roll Chef" Kerry Simon's inspired creations at the Pajama Brunch at noted celebrity haunt Simon Restaurant and Lounge, one of the city's hottest Sunday brunches. Simon's whimsical brunch menu items include chicken and waffles and his famous "Junk Food Platter" with old favorites to be shared, such as Sno Balls and other Hostess cakes, Rice Krispies treats, cookies and cotton candy. The piece de resistance is the Bloody Mary Buffet, a "make your own" choice of vodka, tomato and vegetable juices, chopped cilantro and parsley vegetables, beef jerky, stuffed olives and a variety of salts and spice blends -- or "All You Can Drink Champagne," mimosas and bellinis. Miss your favorite neighborhood spot? Maybe it isn't the most elegant, but it serves just what you want, when you want. Comfortable, friendly and always fun, First Food & Bar can pinch hit! A hit with restaurant industry insiders (and they ought to know! ), First is overseen by Chef Sam Demarco, who brings a flair to the ordinary with his own spin on popular dishes such as Philly cheesesteak dumplings and his New York egg "Sam"wich with tater tots. The edgy, distinctly urban decor awakens your senses so you can enjoy a brunch including whole bottles of bubbly from a champagne fountain delivered until you say "no mas." If bloodies are more your style, there's a "Rolling And Strolling Bloody Mary Cart" driven tableside. Want your bloody even more interesting? You can add a Slim Jim to it, or a rim of Andy Capp hot fries. The Fountains Brunch at Jasmine at The Bellagio in Las Vegas. Vegas' newest brunch is at the Wicked Spoon Buffet, in the Cosmopolitan. Its multicultural cuisine, coupled with a high-end gourmet experience, provides for a great start to the day. Signature dishes are served tapas style in individual portions. Stations include Asian, Italian, Grill, Carving, Salads International and Comfort Food, and the choices include dishes such as sake-soaked turkey with black pepper glaze or spring pea agnolotti with charred corn, Calabrian chili, and lemon tarragon will amaze you. This is no ordinary buffet; the tableside preparations of signature cocktails alone make you feel like you're king for a day. If you'd rather remain low-key, you can simply partake in the limitless champagne or bloody marys. For a more sublime experience, including sweeping views of the Bellagio's ( MGM - Get Report) world-renowned fountains, the Fountains Brunch at Jasmine entertains with such gourmet fare as Peking duck carved tableside, build-your-own-omelets made from organic brown eggs, Kobe beef carpaccio-wrapped white asparagus with truffle emulsion and American caviar with buckwheat mini waffles and chive creme fraiche. Add to that live cooking stations, tableside preparations such as a pea meal Canadian black bacon or honey-glazed slab bacon and a wine list that boasts aromatic whites and medium-bodied reds, domestic and French, and you have an unrivaled gourmet Asian brunch experience not to be missed. If you'd prefer a zenlike brunch with a punch, MOzen Bistro is for you. A play on "Mandarin Oriental" and "Zen," the name is apt given the restaurant's clean, crisp interior, which is outdone only by its eclectic Asian menu. At once authentic and contemporary, its brunch includes items such as pan-seared scallops with tapioca pudding, fried buttermilk chicken liver, bacon and poultry jus and Nantucket egg (grilled jumbo lump crab cakes, poached eggs, baby spinach and hollandaise sauce). To top it off, you have a choice of free-flowing Ty Ku sake cocktails such as the Ty Ku mojito and Ginger Crush, Veuve Clicquot champagne or mimosas. Hankering for a taste of Paris without leaving the strip? Morels French Steakhouse & Bistro at the Palazzo ( LVS - Get Report) boasts comfortable patio dining overlooking the strip, two private dining rooms and several bars -- only one of which is for cocktails. There's an iced seafood bar, for instance, and a cheese and charcuterie bar, as well as a windowed wine cellar with more than 400 varieties of wine inside it. Top off your sweet and savory ham and gruyere crepes with a bloody mary or maria from the Handcrafted "Bloody" Cart served tableside, with shaved horseradish, fresh-cut herbs, pickled garnish, your choice of frozen vodka or tequila. Enjoy any, or all, of the above for your brunch and booze explorations.